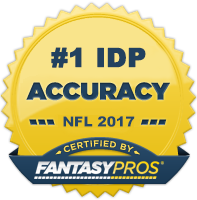 Hello and welcome to this season-long series for IDPGuru.com. In this article, I will discuss a few players whose fantasy value has either gone up or down depending on their performance, role changes, injury concerns, etc. from the previous week. I will try to get this article out every Wednesday for your reading pleasure. MLB – Paul Posluszny – (JAC) – I should have put Posluszny on the Stock Down report weeks ago. I tried to hold off and give him the benefit of the doubt. It figures the week I finally pull the trigger and put him down, he shows up for the Jaguars. In his week 4 game against the Saints, Poz had 9 solos, 4 assisted tackles, 1 sack and 2 passes defended. He should have a solid match-up against the Bengals in week 5. It will be better if Benson avoids suspension as they will run him a lot to protect their young QB. LB 2/3 value this week. SS – Eric Weddle – (SD) – Weddle has been pretty solid thus far. He did struggle some in week 3 but came back strong last week against Miami. Weddle finished with 6 solos, 2 assisted, an INT and 1 pass defended. Weddle has always been a league leader in tackles for defensive backs and should be viewed as a solid DB2 in tackle heavy leagues. LOLB – Ryan Kerrigan – (WAS) – Kerrigan has been the lift the Redskins defense needed coming into this season. Kerrigan is a rookie but thus far has had pretty solid numbers: 18 total tackles, 3 sacks, 2 forced fumbles, and 3 passes defended in only 4 games. He should be productive for the rest of the year as Washington will most likely be behind at the end of most games and be facing a lot of runs to finish out games. Kerrigan should be a LB3 with LB2 upside in big play scoring systems. SS – Yeremiah Bell – (MIA) – Bell is averaging 9.5 total tackles per game. This is another example of the new NFL. Bell has always been a solid tackle player but he is on a tear this year. He is on pace to finish with 152 tackles. He will slow down and probably finish around 110 tackles. Miami’s defense is ranked 30th overall due to their 30th pass defense and 17th ranked rush defense. So in short Miami’s defense is going to see plenty of tackle chances and that means Bell should be a stud IDP, especially if your league requires you to start a DB. SS - George Wilson – (BUF) – Wilson is another DB that has been solid through 4 games. Wilson is averaging 9 totals tackles per game. Wilson has always had this type of potential. Some injuries slowed him last season after a monster 2009 campaign when he had 103 tackles. He should be in your lineups going forward. He, like Bell and Weddle, are strong safeties that get a lot of time “in the box” which translates into more tackles. LDE – Chris Long – (STL) – Long has been a disappointment through 4 weeks of the season. He has a total of 8 tackles, 3 sacks and 1 pass defended. The 3 sacks are encouraging, but his 2 tackles per game are really holding back his potential to be anything more than a DL3. As bad as the Rams offense has been, Long should have had enough tackle chances to come up with more than 8 total tackles. RDE – Julius Peppers – (CHI) – Peppers is another defensive lineman that hasn’t produced to date. Peppers has a measly 9 tackles and 2 sacks so far. He did block a FG against Carolina Sunday. However, he has not lived up to his draft rankings and should be on your bench until he starts producing more consistently. RDE – John Abraham – (ATL) – Sticking with bad d-linemen this week, Abraham has a whopping 8 tackles, 2 sacks, 1 forced fumble and 1 pass defended. He is on pace for 32 tackles and 8 sacks. Abraham had much higher expectations from owners this season. LDT – Ndamukong Suh – (DET) – Now Suh was my highest ranked D-linemen coming into the season. I figured he would be giving offensive linemen and QBs nightmares. So far he has a pretty pedestrian 12 tackles and 2 sacks. When Fairly gets healthy, Suh should see less double teams and start producing at a higher rate. I have kept him on my bench and went with Charles Johnson every week so far and will continue to until Suh steps up. LOLB – Clay Matthews – (GB) – OK, I’ve run out of Lineman this week and finally get to a linebacker. Matthews has been pretty slow in the sack department this season. 1 sack is it so far. Last season he averaged almost a sack per game in getting to the QB 14 times. If you have him in tackle heavy league, you may want to look else where as he is not and never has been a tackle guy. In big play leagues, he should probably hit your bench and be used in good match up games at this point.